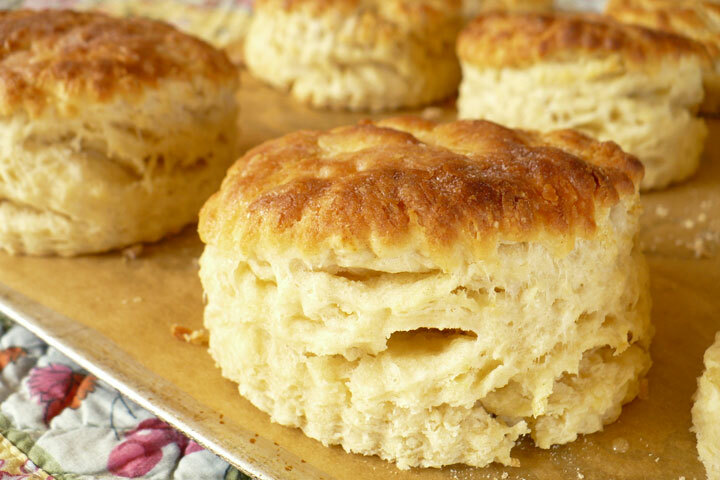 If you haven’t made buttery biscuits because you were afraid you could use them as the foundation for your new house – these biscuits are for you. Easy and delicious! Place dry ingredients in a food processor and whiz to combine. Add butter and pulse til the butter looks like peas. Dump into a mixing bowl and add the milk and honey and stir until it comes together. Then pat the dough with your fingers to about ¾ inch high. You can go lower and get more biscuits but they won’t be as high. You can cut them with a biscuit cutter, a tin can or a glass but don’t use a seesaw approach as that will reduce the rise. If you want soft edges like I do, place them about an inch apart on a baking sheet covered with baking paper. I used a knife and cut them square and had no leftovers. You may brush the tops with melted butter or milk before baking but I always brush with butter right after they come out of the oven. I like to let them rest for about twenty minutes before baking, but, seriously, I’m usually so hungry by this point that I just toss them in the oven once the oven is hot enough.. Bake at 450 for 10 minutes or until they are done to your liking.